Lacking military training or discipline, the rare ocassions when saurians choose to fight a pitched battle tend to be savage and frenzied affairs. Left to their own devices the saurians' battle lines rapidly devolve into a number of individual melees. Here distinction is earned not through leadership or tactical ability, but sheer strength and fierceness, and the saurians' champions earn their positions through feats of personal prowess rather than any sort of command ability. Although this leaves saurian warbands deficient tactically, the power and ferociousness of their champions is not to be underestimated. 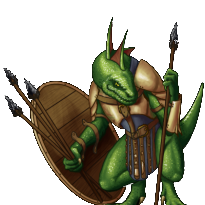 If a saurian warrior survives enough battles he is declared a champion among lizards. From a distance, he throws spears to weaken a foe before approaching in melee, where his skill with the halberd he wields has become so great that few enemies ever escape unscathed.